Tomasz Niedziolka is an artist and ceramicist living and working in Poland. 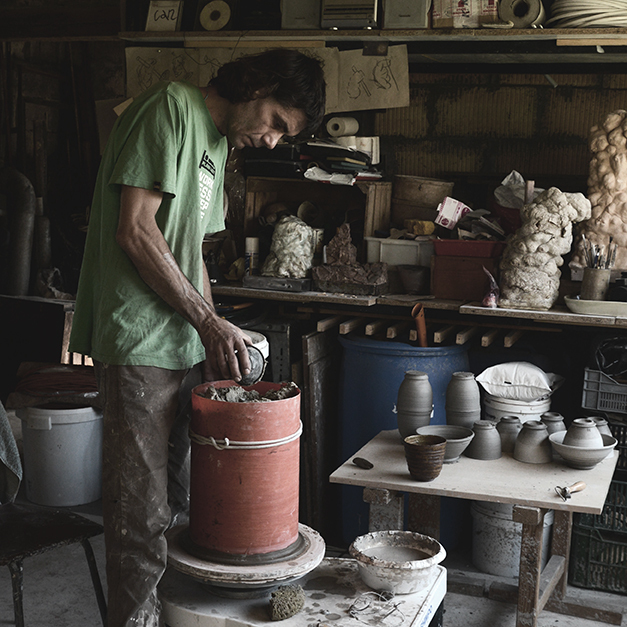 His work is guided by an open dialogue with the material clay. This cooperation begins by preparing the mass itself. Without forcing, only in action and reaction, he shapes the clay body. As a gesture, he uses wood-firing, letting the flame give the last touch. I don’t see myself as a rebel. Routine scares me the most. Not necessarily, but sometimes you do need to throw out all knowledge to be able to feel and understand something. Yes, I do! I really like the pieces, I even take pieces with me when I go travelling. Dishware is simply meant to be used, the rest is playing with aesthetics. The Dancer cups refer to enjoying life and are meant to feel as if they were dancing. The Pillow plates are made to be more heavy, like after a long deep nap, with sleep marks on the surface. The clay is my working material. I have been gathering clay from different ceramic factories in my surroundings, and I have also been harvesting clay in the countryside. I experiment regularly with all types of clay before I start creating a new object. Whenever I am travelling I take a tea bowl with me, I am trying to create the perfect pocket-size tea bowl. I was born in the region of 1000 lakes. I remember as a teenager I used to go with my brother to the forest for a few days to stay with nature. We took just what was necessary with us in the backpack. We always walked trying to stay as far away as possible from the main roads, sleeping in the tent or outside. We bought food from a little village shop or directly from farmers. Once we stayed without eating all day and we decided to try fishing. We only had some branches and a found nail, we spent half day close to the lake, catching small fishes. It was great, but we were getting so hungry. We decided to take the rest of our bread and put it in the water to catch some bigger fish. In the evening we made a fire and had a delicious half raw half burned meal. Which are your 3 favourite pieces on Jouw… ? I really like the works of Stuart Cairns and the pieces made by Aino Nebel.